Are there Ants With Wings? If Not, What Kind of Bug Is This? Are There Ants With Wings? Or What Kind of Bug Is This? The only pest worse than ants are ants with wings. Saying these things are annoying is an understatement. If you find yourself with this problem, you may be feeling a bit overwhelmed. Where do I start? What can I do to get rid of these bugs? Below you will find the answer to these questions and many more. We will start with the basics of identifying ants with wings and work up to how to protect yourself against them if you have and have not dealt with them in the past. First, you will need to be absolutely sure you are dealing with ants with wings. These pests look similar to other pests and identifying them can be confusing. Winged ants are commonly called swarmers or reproductives. They can emerge after a particularly heavy rainfall. Several species of ants have winged ants among them, while others do not. Generally the queens and males are the ones who will have wings while the workers just forage for food and keep the colony going. Once the female ant has mated, she will shed her wings. The reproductive males die immediately after mating. 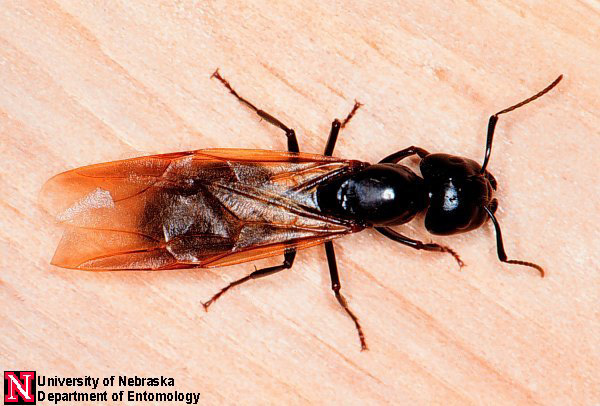 Sometimes winged ants and winged termites are mistaken for one another. Both are pests but need to be dealt with separately. Ants with wings have two sets of wings, with their back set being smaller than the front. Their antennae are curved, not straight. Winged termites have straight antennae, the same size wings for front and back, and a more broad body structure. If you are unsure about which pest you are dealing with, it is suggested that you call an exterminator to help. Since you have already deciphered your pests are ants with wings, the next thing to do is to figure out what species of ants you are dealing with. Your location will have a lot to do with it, especially since only certain species live in the southern part or northern parts of the United States. If you are dealing with an ant problem, you will need to meet it head on. Deciding early on whether or not to use chemicals when dealing with ants with wings is important. Consider how it will affect your household. Do you have pets or children? Are you or anyone else allergic to chemicals? Based on those answers you can begin your journey into getting rid of the ants with wings. Many people attempt to get rid of ants with wings without using chemicals. It is the most environmentally-friendly way to go about it, but it isn’t always the most effective. Below you will find suggestions that may deter or kill ants without using any harsh chemicals. Water and vinegar solution. You will need to mix a few tablespoons of vinegar in with water and place it in a spray bottle. Spray this on the live ants you are seeing and also along the path you are seeing the ants travel. Build sticky barriers. Buy any commercial product (like Tangled Foot) you see that will allow you to build your own sticky traps. The idea behind this is the ants will get stuck trying to find food and will either die or be killed by you. This isn’t expensive and is definitely worth a shot. Build a moat using soapy water. Make a sudsy water solution with dish soap and water. You can place this solution around your plants to avoid having the ants attack them. This will also work for things like a candy dish or fruit bowl, which are commonly left on the counter or kitchen table. Using pesticides and chemicals to get rid of ants with wings can be dangerous. You will need to be absolutely sure what the risks are associated with using the product, and whether or not your children or animals will be affected. Below you will find suggestions for both indoor and outdoor use. Insecticides. From actual sprays to dust, there are plenty of products available on the market. When you have located the nest, if it is easily accessible you can use a regular spray insecticide you have picked up at the local hardware store. If you have found that the ant colony is located behind a wall, you will need to drill tiny holes into the wall to ensure the chemical dust will reach the nest. If you do it wrong, you will continue to have problems with the same colony of ants for quite some time. Baits. You can purchase bait at any local hardware store, or make your own with jelly and dry pet food. You may have heard bait referred to as ant hotels in the past, and sometimes they still are. While this is a less invasive way to use chemicals in your home, it is also one that will take quite a while to get the job done. It could take several weeks to kill the entire colony and sometimes even months. The way the bait works is you place the homes (or ant hotels) around your home. You can hide them behind furniture, up on the counter, inside cabinets, and any other place you can think of. The ant will crawl into the contraption and then feast on the pesticide. It will bring some of it back to the colony with it, affecting more ants. This is a slow process but can be quite effective as well. Aerosol spray insecticide. This will also be found at your local hardware store. Raid is a popular brand used by many homeowners. Be sure you are checking the label to ensure it is for indoor use. You can use this spray to kill ants you are seeing on contact. It isn’t a long-term solution but works well for the issues directly in your face. An insecticide barrier. This is used outside of the house to prevent the ants from coming in. It is a good idea to use in the early spring and keep re-applying until just before the first freeze. Generally ants with wings will enter your home from the outside, and this is the first step in eliminating and preventing the problem. Build a food trail. In order to find the nest and treat it, you will need to see where the ants are coming from. By setting out some food, the ants will give you a visual of where their nest is. The ants will carry food back to their home and often continue to use the same back and forth route. If you are able to determine where the nest is, you are doing good. Lawn insecticides. These will also be found at your local hardware store. If you know where the ant colony is, you can douse it using this insecticide. Anticipate using at least a half gallon of the insecticide to be sure the entire nest has been treated. If you cannot handle the issue on your own, you will need to call an exterminator. They can be costly, but living with an ant infestation is not an option. Sometimes the professionals have chemicals that are stronger than you can purchase. Call around and ask for quotes. Businesses that are in the same town and compete will likely offer you a bonus for choosing them by giving you a discount or upgraded service with no additional charge. Ants with wings inside your home are a sure sign of a colony present. The queen will lose her wings once she has mated, which likely means she has found her new “home.” Keep a close eye on where the activity is happening and deal with it immediately. Ants with wings are an unpleasant pest and the sooner you get rid of them, the better.